if you don't already know, Michael officially signed a two-year, $32 million deal with the Houston Astros on December 19. he parted ways with the Indians following a 10-year tenure because they weren't in a position to retain him. that was made clear five days after the World Series ended, on November 2, when they didn't even extend a one-year, $17.9 million qualifying offer to Michael, so he entered into free agency for the first time in his career. and it led him to the 'Stros. hi there, Brantley fans! i hope you had a good Christmas🎄 if that's a holiday you recognize and celebrate. i joked that Santa Claus delivered Tribe fans' present to Houston by mistake and now it's gonna be stuck there for the next two years...😞 sad, but true. hello again, Brantley fans! this is the second blog in my series analyzing Michael Brantley's career numbers and stats from his 10 years as a Cleveland Indian. it consists of his batting order position numbers, along with his left field, center field, PH, DH, PH for DH, and PR numbers. the format is the same as my typical BOP wrap up blogs, though keen-eyed readers will be quick to spot that there are a few changes. hey, Brantley fans! after much debate, i decided to compile a trio of posts featuring Michael's numbers and statistics from his 10 years as a Cleveland Indian before he starts adding onto his MLB career stats with numbers from his new team, the Houston Astros. the first installment of my three-part series is his game-by-game numbers and notes. if you're a long-time reader of mine and have followed along with my end of the season wrap up blogs, then you're already familiar with this and how it's gonna go. if not, well, it should be easy enough to pick up on because i section off and divide everything for clarity. but before Michael gave approval to this new contract with Houston, there was a lot of speculation and rumors floating around this month and i've got them all right here for you now. 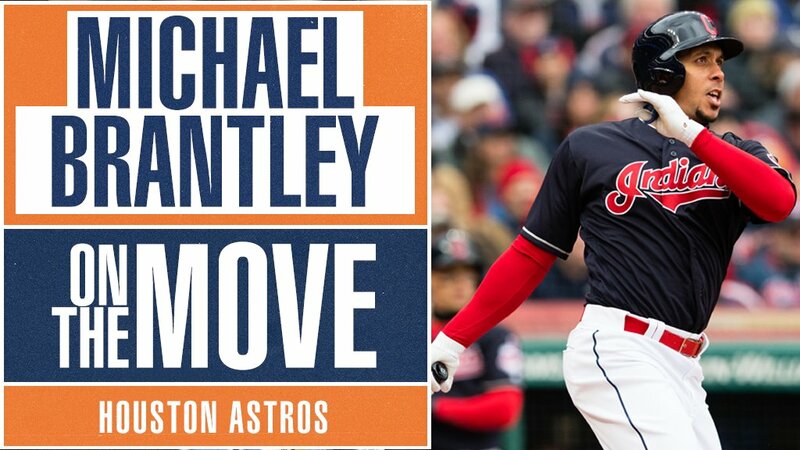 and in case you missed the rumors and reports from November, or just want to re-visit where Michael was said to potentially go last month, please refer back to this blog: Brantley News and Rumors from November 2018.
this is a sad day for Tribe fans, but a good day for Brantley fans. and if you're both like i am, then i'm sure you're very torn. after being with the Cleveland Indians for 10 years, he is no longer ours. today, on December 17, it was announced that Michael Brantley has agreed to a two-year, $32 million deal with the Houston Astros. hey, Tribe fans. how ya doing? 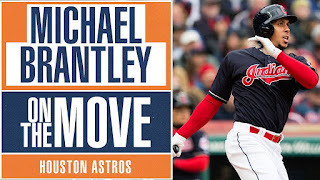 i'm truly sorry for the delay with this blog, but with all the Michael Brantley news that came out so early during this offseason, i didn't have as much time to dedicate to working on this as i usually do. my apologies. it's already been a little over five weeks since the Cleveland Indians' offseason began on October 8, after what turned out to be a quick postseason appearance. their 91-71 record was the worst of all American League playoff teams and that's part of the reason they were considered underdogs. the Tribe officially won the AL Central Division on September 15, but they really had it wrapped up after like the first month of the season. not one divisional team presented serious competition for this Indians squad and now many are speculating that that could actually have been why the Indians got swept right out of the American League Division Series against the Houston Astros. angry fans also pointed fingers at manager Terry Francona and some of his decisions, including leaving a pitcher in the game for too long, not leaving a pitcher in long enough, and calling the wrong relief pitcher out of the bullpen at specific times. and that's to say nothing of the lack of hitting in the series, which the hitting coach is getting much of the blame for. whoever you want to be mad at, well, your feelings are justified. if the Indians continue to own their division each year, but keep losing in the playoffs, or worse keep getting knocked out of every ALDS, how can anyone be content with that? i get it and i feel the same.